Discovery desires – HubNut – celebrating the average! Fleet changes continue with the Nissan Bluebird currently up on Ebay, and the Ford Maverick likely to follow suit. A lack of interest and funding means I need to streamline the fleet a bit. The Maverick is a tricky one. It’s very capable but I’m just not feeling any connection to it. Instead, little things are starting to annoy me. I’ve never been a fan of part-time four-wheel drive and not having a centre differential is just a pain. That means that the two axles cannot rotate at different speeds – something that is essential if you want to be able to go around bends. That’s fine off-road, where it effectively acts like a locked centre-diff on a Land Rover, improving traction, but I find it a real bind having to change between two and four-wheel drive depending on conditions. It’s also not very good at towing, lacking low down grunt. The ride is far from pleasant. The lights-on warning buzzer makes me want to commit murder. The front suspension is too lacking in travel. It has a Ford badge. So, I’ve decided it’s time to grab a slice of Discovery action while prices are still not entirely out of reach. Doubters will laugh and mock for how could I possibly consider saying goodbye to Japanese (ish) reliability and hello to hopeless Land Rover? Well, for sure, Solihull build quality is right up there with Chinese-built Christmas cracker gifts but the chaps and chapesses are good at knocking out vehicles that can handle the rough stuff. I’m willing to sacrifice the Maverick’s generally excellent road manners for a bit more off-road ability. Working on these still-secret models, with their black-plastic disguises, was absolutely incredible. Especially the few days I spent with the V8 teams. Crikey how their colleagues were jealous – especially those working on the feeble Mpi! (a 2-litre tax-dodge version with nowhere near enough torque). So, a 95MY Discovery would be the obvious choice then. A way to wallow in nostalgia and remember my small part in helping that version reach the production lines. Well, no. You see, at the end of my week, as if it wasn’t already brilliant enough, I was whisked down to Eastnor Castle. In the land surrounding this impressive building, Land Rover frequently undertakes off-road testing. A group was being treated to a day out as a reward for helping to move the production line of the Range Rover Classic – to make way for the even-more-secret Range Rover P38. Towards the end of the day, one of the Validation chaps asked me whether I’d like to drive a Land Rover. I was only 15 but somehow managed to squeak out a ‘yes!’ The steed chosen was a Discovery 200Tdi automatic prototype (J34 VKV – are you still out there?). It was white with a delicious beige interior. I didn’t just get to drive it. I got to drive it off-road! It was absolutely incredible and here’s a picture of a tiny me at the wheel. 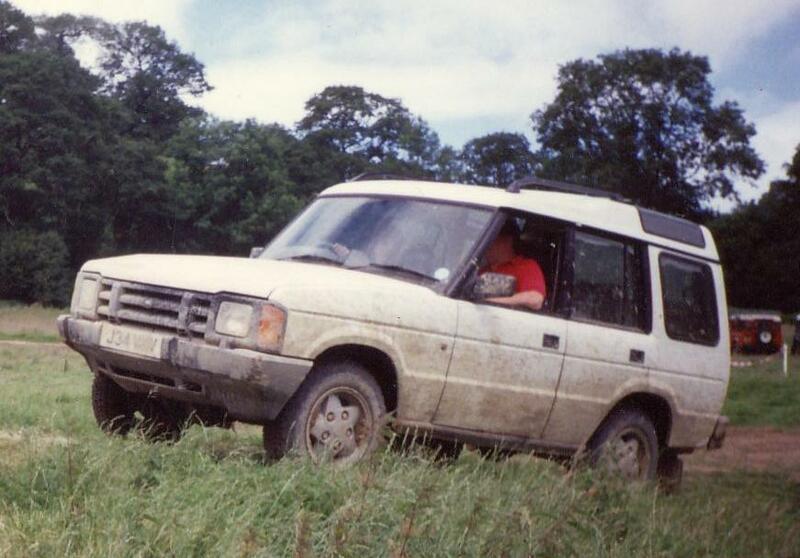 A 15-year old me driving a Discovery! You see, I think this rather trumps my time working on the 95MY prototypes. I’ve always preferred the looks of the original Discovery anyway, with that front end seemingly borrowed from the Mk2 Ford Transit van. It’s a real parts-bin special as naturally development funds were minimal. The headlamps are also seen on the Leyland-Daf 200 van – or later Sherpa as it’s also known. The rear lights are Maestro van. The door handles are Allegro/Marina and the column stalks very similar to those used in the Montego. The chassis and main body structure was Range Rover. Despite this, designer Terence Conran managed to create a rather delightful interior, finished in beige or blue and the overall look was one of a new vehicle, not just a Range Rover with a lumpy roof. At launch, engines were the venerable then-19-year old V8 with twin carburettors or an all new direct injection diesel engine – the legendary Tdi. And that leaves me with another dilemma. Which engine? Sure, the Tdi offers more economy, but the V8 sounds nicer and will deliver close to the MPG that my Maverick is delivering. V8s have more often enjoyed a softer life and do without turbochargers and cambelts – though the number of head gaskets to potentially fail is doubled. I don’t think I can really afford to me choosy with my budget, so I’m just going to get whichever seems good at the time. Neither will be a bad engine and I don’t mind the sound of the Tdi. After all, it reminds me of my first ever drive and of a week spent in a factory in Solihull where that distinctive rattle was always hanging in the air. So, sorry Maverick. Nostalgia wins. I may regret it, but if I don’t buy a Discovery soon, I’ll regret that even more I think.